The book contains 5 nursery rhymes inspired by five of the ten principles that make up the Manifesto of non-hostile communication. Inside the book, parents and educator will find a useful section to learn how to explain to children difficult topics like the safety on the Net and the responsible use of the web. For instance: “The Net is like a forest: you’d better to go with someone older. Don’t tell your name, your age or your address to people you don’t know”. 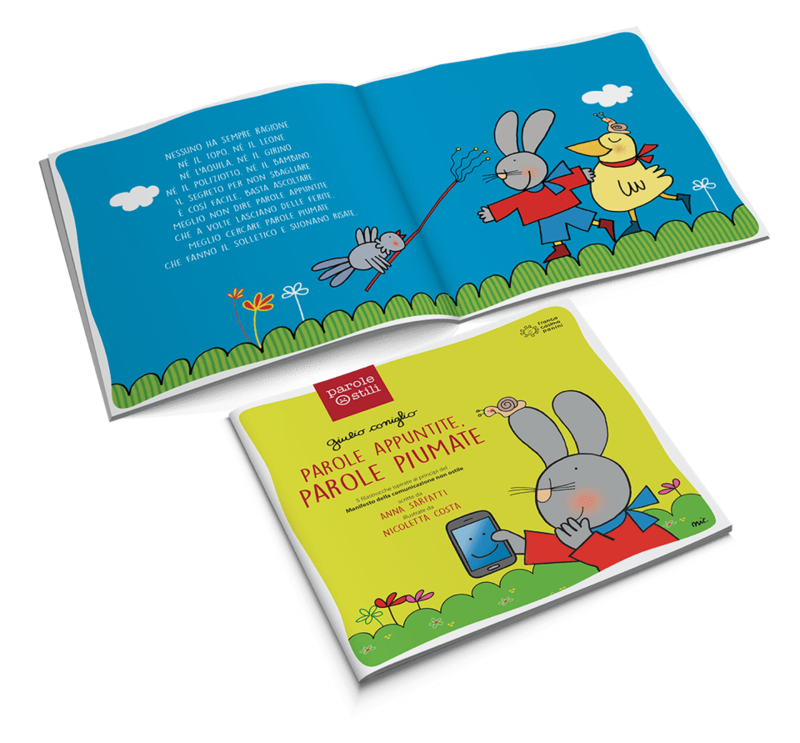 “Parole appuntite, parole piumate” is an essential tool to help children entering the world of web in a safe way. Anna Sarfatti lives in Florence, there she teached in kindergarten and then in primary school. At the moment she works as full-time writer of books for children, but she writes also essays and articles in the educational and pedagogical field. She is engaged in searching educational paths and tools to promote the rights and the active citizenship among children. She also won the prize “Colette Rosselli” for the book La Costituzione raccontata ai bambini. Nicoletta costa is a great architect, but she was a great artist since childhood, in fact she debuted at 12 with her first book, since then she has never stopped publishing hundreds of books and established herself as one of the most internationally famous illustrator. She mostly writes her books, especially if she deals with picture books. She created characters like Olga the cloud, the conceited tree, Teodora the witch and Giulio the rabbit. She won several prices, like the “Catalonia d’illustracciò” prize, the “Golden Pen” prize, the “Andersen – Il mondo dell’infanzia” prize and in 1994 a prize for best author and the e the “Grinzane Junior” prize in 2002. Giulio the rabbit is the first cartoon broadcast by Rai Yoyo and Nick jr.